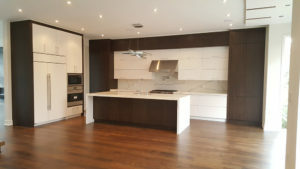 No matter if you want to do some renovation or you have decided to decorate a new kitchen with the help of a reputed agency like Mana Kitchen Design, there will be a sea of choices that will determine the look and work efficiency of your kitchen cabinetry in Woodbridge. Renovation of a kitchen does not only mean for changing the framework and appliances, it also means choosing suitable cabinet surfacing wisely. Here we will give some ideas that you can adopt to make your kitchen modern and smarter. Since wood is a non-toxic and renewable resource, here at Mana Kitchen Design, we use hardwoods. Wooden surfaces allow the users to varnish the surfaces or paint them when required. Today, wood is one of the most preferred materials for kitchen cabinet, because the material sets well with both traditional and modern design styles. This is one of the latest and innovative options used by our experts. The wood-plastic composite is comprised of a combination of wood flour and thermoplastic. The most important benefit of using such composite is that it is less vulnerable to the rot and decay. In addition, it is waterproof and easy to maintain. We also use the PVC sheets because this material is termite-proof, easy to maintain and anticorrosive. The most important fact about using PVC materials is that they are cost-effective and easily available. Materials made of steel and aluminum is comparatively expensive materials. 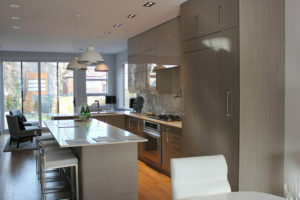 Experts at the Mana Kitchen Design mostly design wood-based cabinets that are strong and durable. 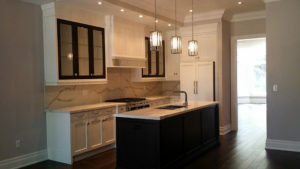 We often include glass and other light material to soften the look of the cabinets. Today, metal sheets are available everywhere with the variants of brushed, etched and pattern. You many not like the color of wood and if it is the case, you can add laminates on the wooden surface. In order to install such laminate surface, we prepare layers of the plastic resin. The compressed sheets of the material are both durable and affordable and it does not require further polishing. 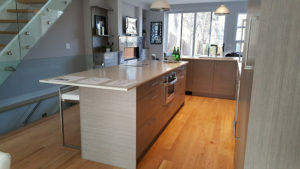 Thus, call us today and learn more about our cost-effective and efficient kitchen cabinetry solutions in Woodbridge.